​Heather Macre is proud to be endorsed by MALF Political Committee, on behalf of Chair Joe Witt and MALF Chair Teresa D’Asaro. Heather Macre is proud to be endorsed by Athena Salman, Arizona State Representative. Mayor of Phoenix and ARIZONA attorney general​. Heather Macre is proud to be endorsed by Corey Woods, former city Councilmember in Tempe. Heather Macre is proud to be endorsed by Daniel Hernandez, Member of the Arizona State Legislature. Heather Macre is proud to be endorsed by Tony Navarrete. He is currently running for State Senate. Heather Macre is proud to be endorsed by César Chávez, Arizona State Representative (LD29). Heather Macre is proud to be endorsed by Jim Holway, a board member of the Central Arizona Project! Heather Macre is proud to be endorsed by Ken Clark, an elected member of the Arizona House of Representatives representing LD 24! Heather Macre is proud to be endorsed by Ben Graff, an elected member of the Central Arizona Water Conservation District Board! 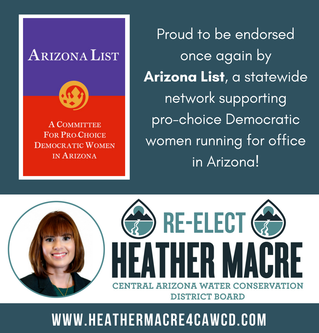 Heather Macre is proud to be endorsed once again by Arizona List, a statewide network supporting pro-choice Democratic women running for office in Arizona! Heather Macre is proud to be endorsed by Juan Mendez, an Arizona State Senator! Heather Macre is proud to be endorsed by Kate Gallego, Phoenix City Councilwoman. Heather Macre is proud to be endorsed by Senator Katie Hobbs. Heather Macre is proud to be endorsed by Former Chair, Arizona Democratic Party, Andrei Cherny.